Neugart USA introduced its compact right-angle, flange-mounted WPLFE gearbox for applications with tight space constraints and powerful torque requirements. With lifetime lubrication and minimal installation height, WPLFE has the flexibility to mount in any direction to help optimize small spaces. 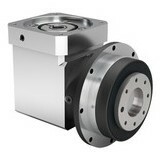 This model’s standardized flange interface makes it easier to mount drive components – such as pulleys, belt drives, rack-and-pinion systems, linear units and rotary tables. In addition, WPLFE’s large flange output shaft diameter provides five times the torsional stiffness of an output shaft with a feather key. WPLFE also comes with low-friction groove ball bearings that produce little heat. For more information, visit Neugart USA website.